Are you searching for a comfortable skin coloured nursing bra? If so, we can highly recommend the Bravado Fawn coloured Confetti nursing bra. We think this is also a great option if you want a low-cut V-neck style bra. So what makes this breastfeeding bra so comfortable? Well, it comes in a stretchy fabric. This means that as your size changes during the day, the bra will gently stretch to give you a perfect, comfortable fit. It is designed in a super-soft fabric. It is made largely comprising Elastane which allows the bra to mould to your shape and give you great support. This bra has also been designed to be seamless, which makes it really pleasant to wear. 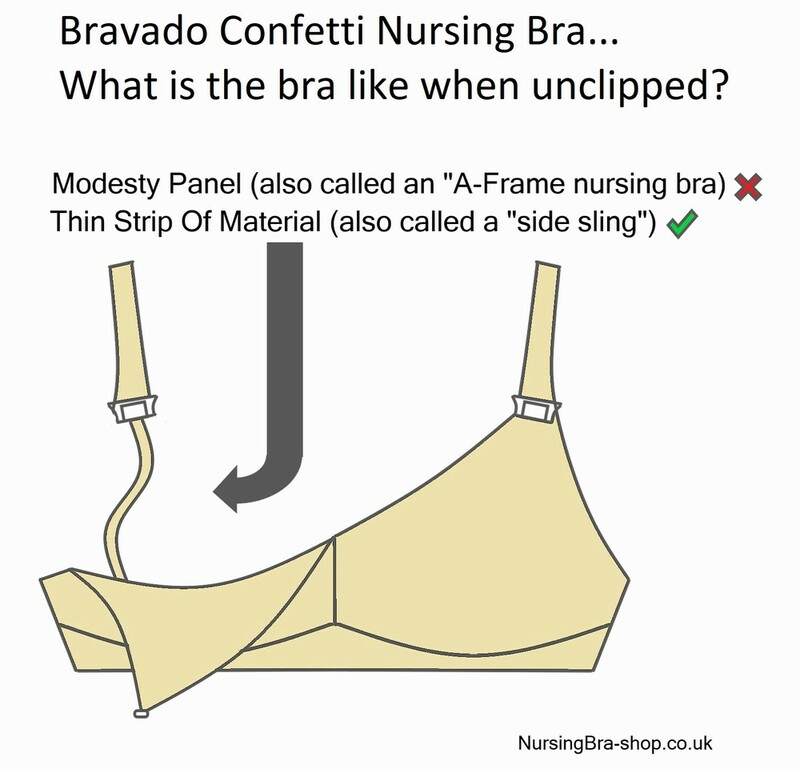 Bravado have also gone to the trouble of making this bra without irritating tags or washing labels....the instructions are even printed on the inside of the bra to stop you getting irritations from the tags you might normally get at the back of the bra. Why do we think this bra is so pretty? Well, as well as being skin coloured, it also has a light Swiss dot pattern on the cup. It has a lovely lace detailing too. We think you will also like the pretty bow between the cups – it really is both pretty and yet incredibly practical. What size should you choose? Well, Bravado have helped make this easy for you by making this bra in just four sizes....Small, Medium, Large and Extra Large. This means that one size will cover you over several bra sizes. This makes it easy to pick the right size in the first place. It also means that as your size changes during the day, you will still find that the bra is really comfortable! To find the right sized bra please see the chart below. So what are the cups like? Well, they fully drop down. This means that you and your baby get full skin-to-skin contact, as recommended by breastfeeding advisers. It is suggested that, if possible, you choose a bra that is not underwired when you are breastfeeding, so you may be pleased to know this bra is wire-free. You may also like the fact that this bra is easy to open with just one hand. This means that you won't need to fumble around whilst holding your baby in your other arm. The Confetti nursing bra is made from 75% nylon, 16% polyester, 9% spandex (excluding the elastic). It can be worn both before and after you give birth helping you get even more value for money. This nursing bra is also available in both Plum and Black. Please see below for these options. 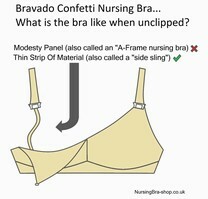 So why should you choose the Bravado Confetti Skin coloured nursing bra? Well, we think you will find it exceptionally comfortable. It is also really pretty and is perfect if you are looking for a low-cut nursing bra.